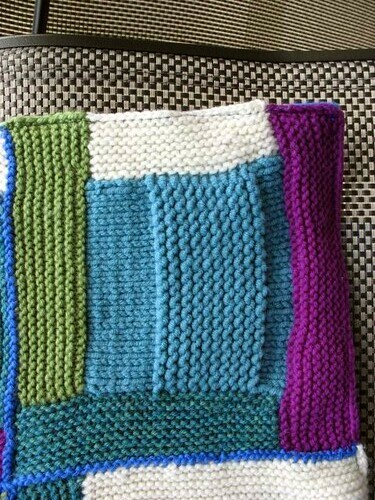 Auntie Ann Knits: Log Cabin Baby Blanket -- done at last!! Some of you with very long memories will remember that I began a log cabin baby blanket months and months ago, as a baby present for a baby due in December. Piece of cake! Loads of time! Right? WRONG! My addiction to sock knitting and my overly ambitious Xmas knit list got in the way, so that I finally began to put the blanket together with only about a week to go before the shower, which was last Sunday (and BTW, the baby didn't exactly help either, he insisted on being born 7 weeks early. Thankfully, he's fine). Anyway, my initial plan was to make it 3 squares by 4. Twelve is a nice number. It worked for Cara, right? But when I started to piece them together, I quickly realized that 16 is a much, MUCH nicer number than 12. Twelve, for this size square, was much too small. See? OK, I realize there's nothing in there to give you a good sense of the scale, but just trust me on this. This led to desperate measures. 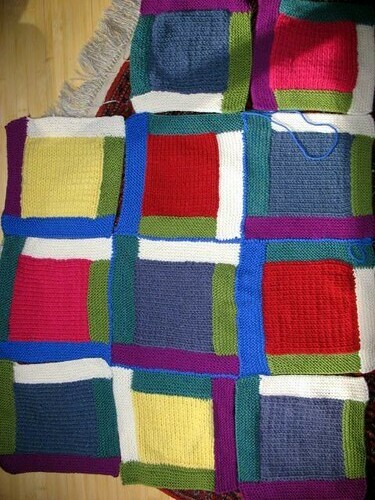 The mission: Produce 4 more squares, seam all squares and attach backing -- in less than a week. DD had knit most of the centers, but currently has a very busy schedule with band, jazz band, and the school play. However, she had last Friday off from school and with the help of some bribery I got her to produce another center. This center was an experiment, I never thought I'd actually press it into service. DD started it and I finished it, and let's just say that our guages are not the same. At all. And I can't tell if my random garter-stitch portion helped or hurt. So there are short-rows in each of the edge strips to help turn a trapezoid into a square. I'm actually rather pleased that I managed to make this one work. I don't think it really looks like the act of desperation that it was. Can you see the stripes? Design feature, or act of desperation when running out of yarn? You be the judge. Also, more with the short rowing. Did I mention that through a stupid mistake that I made at the LYS, the center squares and the edge strips are not even the same weight of yarn? Not even the same fiber? Doh! It made picking up the right number of stitches a challenge, let me tell you. Somewhere in the bowels of DH's camera there is a pic of me holding it, but DD is better looking anyway. The new mom with the blanket. She was quite thrilled. The baby couldn't attend the shower, he is still too little to be exposed to all of us germ-laden people, but there were some fabulous pix of him with his mom and dad. Made me want to run home and knit up some booties. Or maybe not. Finished size: Approx. 36" x 36". 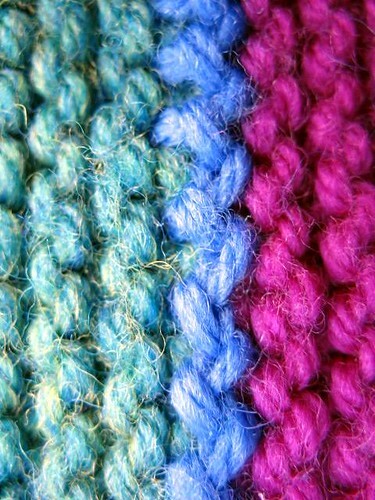 Yarn: edge strips are Cascade 220 washable, centers are mystery bulky acrylic yarn. The whole thing is machine washable and dryable. 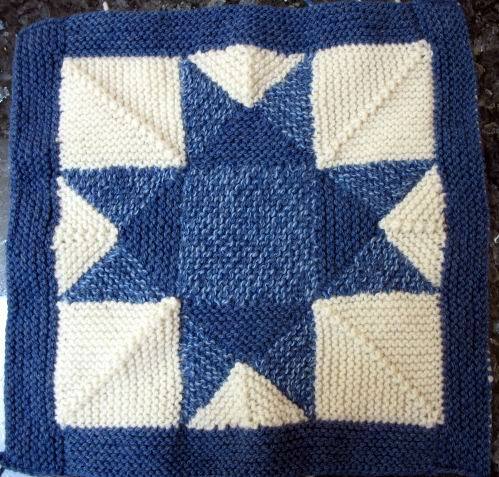 Center squares are approx. 6" to a side, each edge strip was intended to be about 1-1/2" wide, usually this was 7 garter stitch ridges. It was easy to make more or fewer rows if necessary to make the strip the right size. Needles: US 10 for centers, US 7 for edge strips. 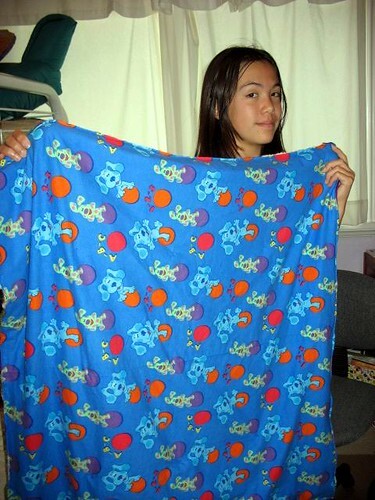 Backing: cotton flannel in "Blue's Clues" print. I wanted a blue flannel print, and this fit the bill. It is attached by tying yarn through both top and bottom at each intersection where four squares meet, with the knots and ends sandwiched between the layers (hopefully this will keep those bits of yarn from becoming a choking hazard). This was done first, to facilitate the knot-tying, and then I turned the edges of the flannel under and machine-stitched around the edges. Making this was a lot of fun, and I learned a lot about how to fake certain things to make this work. I liked my seaming method. 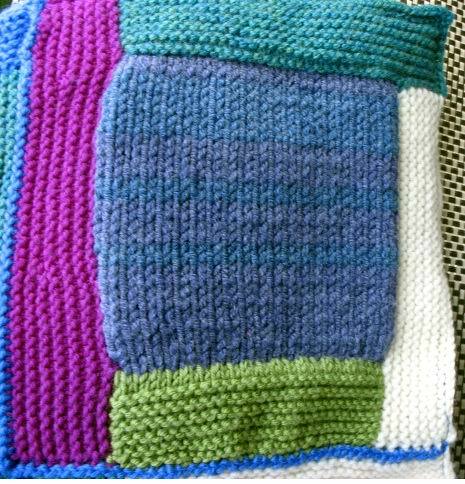 If I had had more time (we finished it 2 hours before the shower) I might have thought to machine stitch through the blanket where the crochet joins are, to add even more stability to the backing. But I think it'll be OK as it is. (I included an "unlimited lifetime guarantee" with the gift.) I would definitely make another log cabin blanket sometime, but maybe I'd try to use only one weight of yarn, huh? Looks like we were updating at the same time! 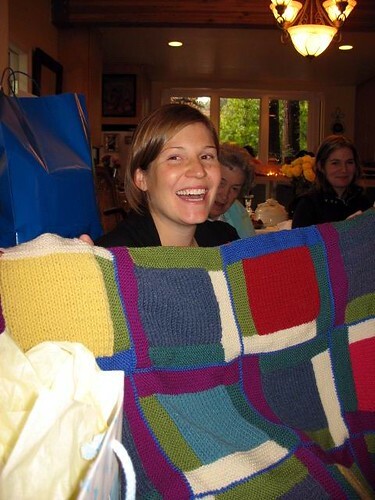 Love the blanket, and I'm glad the recipient does too. Definitely a knit well done. Lovely job, Ms. Ann:) Good experience overall, yes? 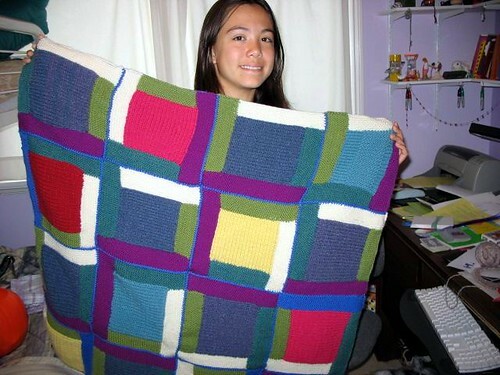 What an excellent blanket and a clever way to join the squares. I've been stewing about this and think you've come up with a winner -- one I must try!